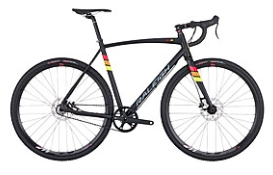 The Raleigh RXS was featured in Men'sJournal.com's "2016 Cyclocross Bike Buyer's Guide" for its single-speed gearing that yields a light, simple and quiet riding experience. The RXS is designed with front and rear thru-axles for pedaling efficiency and the Gates carbon belt drivetrain makes the RXS virtually maintenance-free. Editor's Note: "...Probably the best stock singlespeed cyclocross bike."